Monday saw the release of a paper that Steve Gatesy and I have been brewing up for the past couple of years. 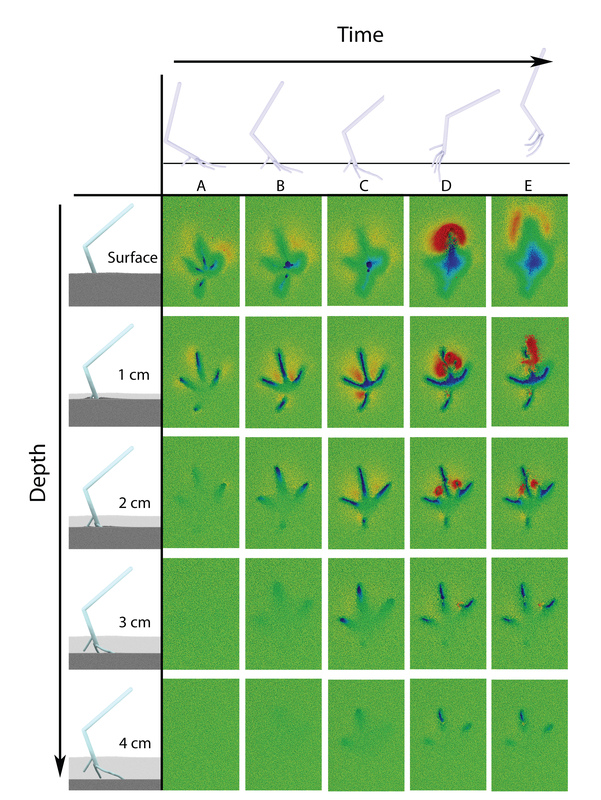 The paper is published in PNAS, and is titled: The birth of a dinosaur footprint: Subsurface 3D motion reconstruction and discrete element simulation reveal track ontogeny. It’s a bit of a long title, so what does it mean? Well, in short, we’ve used X-rays to see what a bird’s foot does under the surface, when the animal walks on a soft substrate, and we’ve simulated the sediment – every grain of it – to see how footprints are formed. The ‘Track ontogeny’ bit [a great term Steve came up with] is our way of communicating that we can see the development of the track – we can watch it being formed at any depth, and any time in the step cycle, thanks to the simulation aspect. When I started my fellowship, my big question was ‘how do dinosaurs move differently from birds, and is this visible in the tracks?’ It turns out that’s a little more difficult than it first appears (and if we’re honest it’s not trivial at first glance) – how do birds move? And perhaps more importantly, how does that express itself in footprints? It turns out, we don’t really know how birds move [recent research by my Robert Kambic et al, shows how little we still know]. We also didn’t really have an idea of what the foot was doing beneath the sediment surface because, well, the foot is opaque, and the sediment is opaque. I was lucky enough to be working with Rob while he was collecting data for the above paper, and we used similar methods to capture the motions of a bird crossing a soft substrate. That method is X-ray Reconstruction of Moving Morphology, or XROMM. I won’t go into too much detail, you can read up on the XROMM website for more. Suffice to say, that by simultaneously recording two x-ray videos, the 3D motions of all the bones can be reconstructed. This is the first time anyone’s been able to see how the foot moves beneath the surface. It turns out that it’s pretty different to how the animal walks on a solid surface – the toes sink to a considerable depth, and rotate backwards. So that’s the foot motion of the bird, now how do we link it to footprints? Obviously we have the real poppy seed surface, which we documented with photogrammetry and then brought into the XROMM maya scene – so it shows up in the video above. But we can’t see what the poppy seeds are doing because they just form a big grey mass on the X-ray video. We did try putting in small metal beads and following the black dots, but once you get above a dozen or so, it becomes incredibly hard to track yet still provides little resolution. Ellis and Gatesy did just this a year or so ago with a severed bird foot in XROMM. The answer then, is simulation. We used a technique called Discrete Element Analysis, specifically we used the open-source program LIGGGHTS. The Palaeo folk reading this may be familiar with Finite Element Analysis, and indeed I used that method throughout my PhD and recently in a new paper. So now we have foot motions, and sediment motions all in a big virtual worldspace, what next? Remember right back at the top my original goal was to try and understand how dinosaurs moved from their footprints. Well, we’re not quite there (that has since become a career goal, rather than a single grant goal), but now we can at least look at fossil tracks and potentially link certain features to certain foot motions. In the paper, we use an example track from Amherst Museum of Natural History. We’re able to identify features in the fossil associated with motions of the foot, for instance a trio of raised lumps that are linked to the withdrawal of the foot. I don’t want to get into the ins and outs of feet going in and out of sediment right now, so suffice to say that the track ontogeny concept should hopefully help interpret tracks where the exit is superimposed on the entry, and it’s not clear which is which. Figure 3 from our PNAS paper, showing the track left on the surface and at subsurface intervals, through time. Click to get the full size that should have been included as supplemental info with the paper. Falkingham PL & Gatesy SM (2014) The birth of a dinosaur footprint: Subsurface 3D motion reconstruction and discrete element simulation reveal track ontogeny. Proceedings of the National Academy of Sciences of the United States of America. This paper will be fully open access in 6 months.